Last weekend saw Richard travel to Rome and work with the current European Challenge Section Champions, Italian Brass Band. During the weekend Richard presented a masterclass as well as an in depth sectional with the bands cornet section. Commenting on the trip Richard said “ What a friendly bunch of musicians. They are so keen to soak up any advice regarding brass bands and how to develop as a section”. Vice-President Giovanni Celestino and conductor Filippo Cangiamila commented, “The goal of this masterclass was understanding what is the best way to approach the cornet. After this weekend we can certainly say that there was a great improvement. The training experience for the cornet section of the Italian Brass Band with Richard Marshall has been illuminating from all points of view. His thirty years of experience, his great competence and his musicality have greatly increased the knowledge about the ‘British Cornet Sound’ of the band. I hope we can take with us this ‘treasure’ for a long time! Richard is not only a magnificent artist and a very serious teacher, but mostly a true FRIEND, a very kind person”. To finish Richard performed as guest soloist with the band. And in his usual style left them amazed with flawless performances. Easter weekend this year saw Altena Brass accompany one of the greatest cornet players of the time, Richard Marshall, in their annual Easter concert. 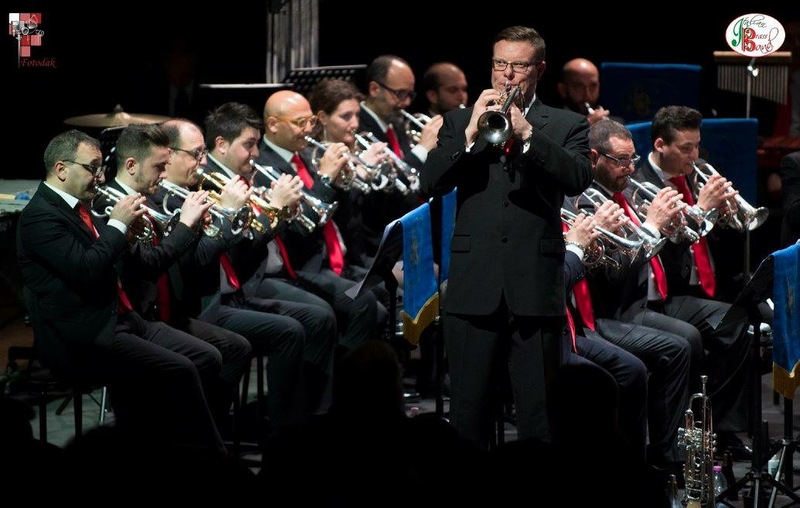 Previous concerts have featured famous soloists such as Ian Porthouse (Cornet, UK) and Bart Claessens (Principal Trombone, Royal Concertgebouw Orchestra). The weekend started with a morning workshop and afternoon masterclass for players from all over the region. Richard shared his theories and knowledge regarding technique and performance. Prepare yourself to be the best you can, cornet playing is not bigger than life itself. At the end there is always friends and family to celebrate with. The evening saw Richard as guest soloist with the band. Altena Brass performed Fraternity, the test piece for the Europeans 2016. Richard showcased his talents in the first half of the concert in Philip Wilby’s Flight and Don’t Doubt Him Now. As a bonus Richard was part of the second half of the concert, playing Emerald Skies, All Night Long and Brooklyn, which saw Altena Brass perform the theatre show Space Chords. Richard impressed all of the participants of the workshop. They enjoyed the day with an excellent tutor and superb cornet player! The concert was a big success and Altena Brass is really proud to have a new musical friend in Richard Marshall.